I'd like this if it isn't sheer. I'd love a Electric Coral Energy Bra. 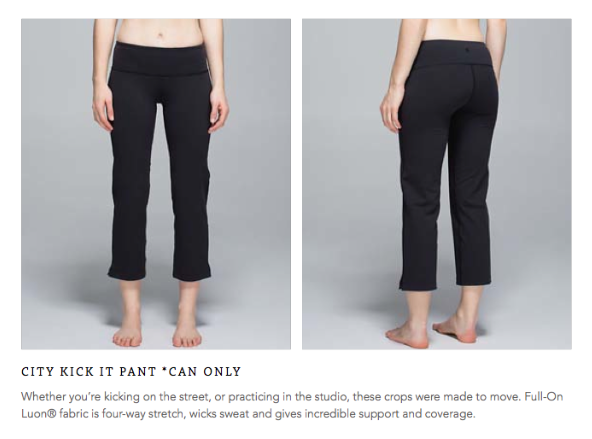 These remind me a lot of older Reverse Groove Crops. The more interesting pieces are showing up in Canada this week so my wallet is safe based on these photos. Man, I wish that were a Free to Be minus the Wild. 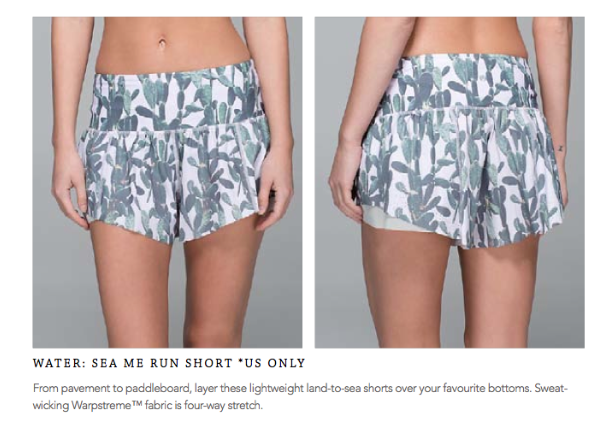 Oh good, I always wanted cactus shorts! @ anon 5:19pm - ouch! Was the previous release of the clear mint CRB sheer? I missed it the first time around and will pick it up when it gets to the U.S...but your comment about it being sheer makes me re-think it. @ anon 5:54 pm - If I remember it right it was backed with white, felt gross, and was sheer. The lighter colors tend to be sheer unless they are nice and thick. Now that I search google for a photo, I might have been thinking of the wrong one. However, I haven't recalled a truly opaque clear mint/light greeny yellow CRB in a long time. Ohhh, NEED that FTBW in Electric Coral! Hope it + that Black Cherry + Electric Coral FTBW Tank are uploaded this next week. 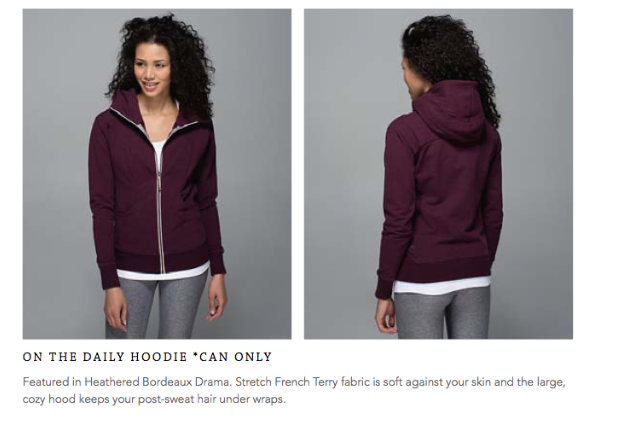 Hi LuluAddict, love your blog!! I am in Washington DC and have just had a very disappointing customer service experience when I called the guest education centre. The pair of Inspire Tights in black/mini blushed illusion/white multi/clear mint that I have been waiting on for over a week and just received in the mail look nothing like the picture... I think these are a pair you have to "cherry pick" but they are not in stores (at least not yet). The customer service rep offered me a 4 day extension on my return time frame after telling me it "really isn't worth going back and forth over" and then after I thanked him and told him I appreciated the gesture he responded "bye now" and then hung up! The whole thing was so juvenile I was truly stunned. I was very pleasant on the phone, I simply said I was disappointed and wished they had disclosed the fact that this item may differ as I have seen them do with other items. I'm a loyal customer and have never had a problem with a product before now. What do you suggest I do? Is there someone I can escalate to? That's too bad. Some GEC people are better than others. You might want to call back and see if you get someone different. I've done that before. Thank you so much! It is a worth a shot! I have seen and tried on the clear mint IRL. I can't compare it to the previous Clear Mint release which I have not seen before. The new CRB is very pretty and made my tan glow :) It is not as soft and thick compared to the Antidote or the Menthol CRBs, but not as scratchy as the Creamsicle Pop as well. I felt it was slightly sheer, but nothing to scream about. But I do have a little tummy, and it was a little more obvious in this CRB, compared to the thicker ones. It was TTS for me, but I wished I've tried the top in my size up to compare as well. @ anon 8:18 pm - thanks for the scoop! Yes, that's good to know. Clear mint is a great spring/summer color, and it would be great to get a CRB in it, so long as it's thick and opaque. I'm thinking it was the faded zap CRB that was sheer...I never bought one but I saw pics and remember thinking it was very unforgiving and see-through. There's nothing appealing here but the CRB and FTBW. 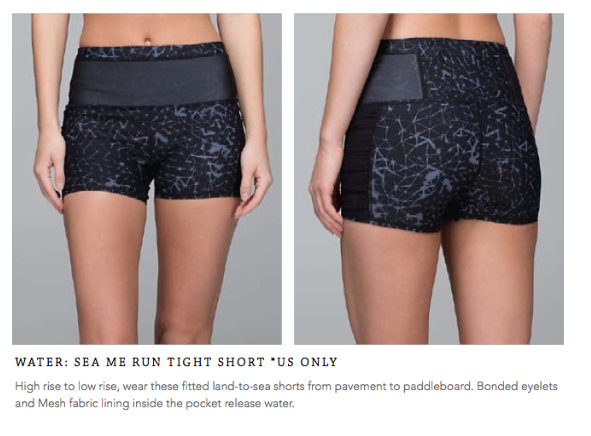 The Water See Me Run Shorts are a disaster in that cactus pattern. I have a clear mint CRB - older release - maybe early 2014? As with everything I have in clear mint, it gets dirty and stays dirty. I wiped some sweat on my face the first time I wore the clear mint CRB and it never came out in the wash. None of my other CRB's have done that. I can't remember what other pieces I had in clear mint because they did the same thing and I sold them. Same with the waistband on my ujayyi (sp?) crops in soot/clear mint. LOVE the color - not sure why it loves dirt!!! @ anon 11:05 am - Good point. My lulu yellows are tricky with stains - especially pale yellows! My zippy green Energy Bra has discolored in the under arms because of my deodorant. I have a Mac N Cheese top that has odd blue/green stains on it in random places. I wish I could wear CRBs. I'm a fit size 4 but after four kids I've got a little tummy and little to no bust. I feel like they just don't work for me. 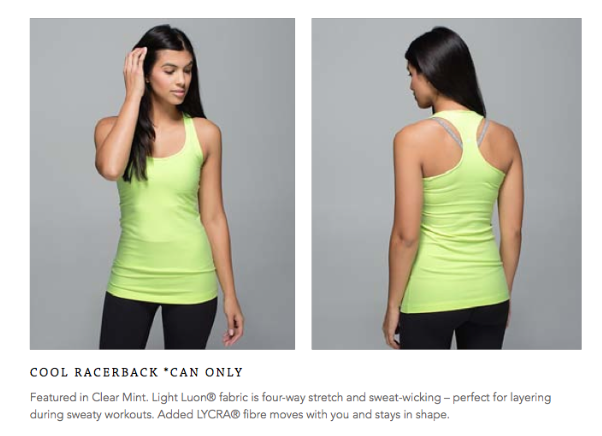 I wish lulu had another basic tank that was always offered in these great colors that I could pull off. 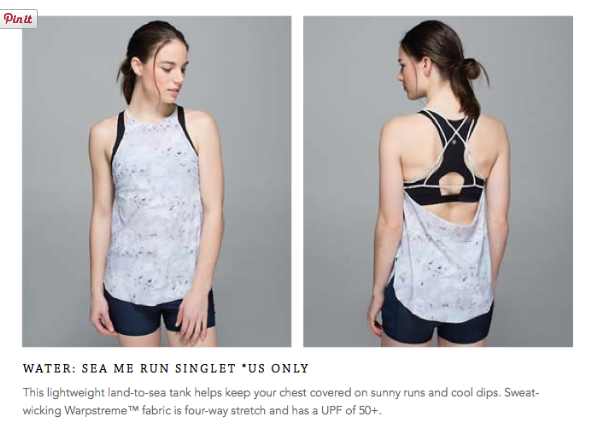 The coastal tank was my fave b/c the fabric was so great. 105 singlets are pretty good but sometimes 'hug' the tummy. Any positive reports on the paddle one piece? I'm very interested in it for kickin around the lake but a waiting to hear something good about it first. I think you may be thinking of that clear mint - or faded zap - that had the whit dots on it. It was cheap and white backed. I do not remember the color name. Imho, forget clear mint, where is solid or heathered Alberta lake?! I know, I am a broken record on this item. As long as they continue making CRBs in great colours (and great quality) I will be happy. It was getting a bit much with a new one for me almost every couple of weeks. @ anon 1:51 pm - you are right, it was Faded Zap, which, honestly, looks just like Clear Mint if you don't have them side by side. They should have had a Vintage Pink CRB. The material on the VP SRB is perfect - thick and soft. It's a crying shame they didn't make one. @ anon 6:45. Simple, tell yourself you would never shop there again. Move on to a differnt brand! I have been cutting it down ever since I had a bad customer service at the sore! I had a GEC told me the wrong holiday return date, some just simply don't know what they are talking about...etc.